Written by Will on October 25, 2012 and posted in News & Updates. 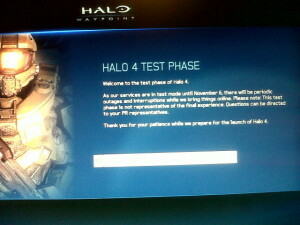 Welcome to the test phase of Halo 4. As our services are in test mode until November 6, there will be periodic outages and interruptions while we bring things online. Please note: This test phase is not representative of the final experience. Questions can be directed to your PR representatives. That you for your patience while we prepare for the launch of Halo 4.